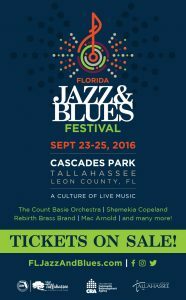 This Friday, history will be made as the first day of the inaugural Florida Jazz and Blues Festival kicks off at Cascades Park in Tallahassee, Florida. The festival’s Artistic Director Scotty Barnhart, is the current director of the Count Basie Orchestra, founded in 1935. Barnhart obviously brings a wealth of knowledge and sensibility to this undertaking. Florida has a rich history in the blues and jazz, and Tallahassee in particular was so instrumental in the careers of blues singer, composer, and pianist Ray Charles, sax legend Cannonball Adderley, and trumpet giant Nat Adderley. Of course, artists performing are from all over the state; Selwyn Birchwood hails from Orlando, and currently lives in Tampa, Florida. Heather Gillis hails from Tampa Florida, and she is currently attending Florida State University and leads her band, based out of Tallahassee, Florida. There are also artists from all over the country, bringing their unique sounds for Florida fans to enjoy. A good portion of the music will be performed acoustically. When amplified, the music will be presented in such a way that the synchronicity of the instruments is not diminished. Along with the performances, the festival also affords educational presentations that allow this music to be introduced to a whole new generation of up and coming fans. Be part of this unique celebration!